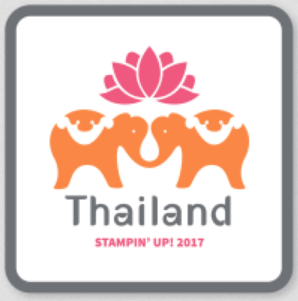 Hi Stampers! I have been playing with the new Illuminate Glimmer Watermark Stampin' Pad lately and want to share this card with you today. As a SU demonstrator I receive a monthly magazine from SU and spotted a similar card featured in the magazine a few days ago. Actually the featured card was done with the SU Shimmer Paint but I used the Illuminate Glimmer ink to make this card instead. Here's a close-up photo for you. I hope you can see the snowflakes better. I stamped them in three different ways. The large snowflake (top left) was stamped in Wild Wasabi first and then stamped in Illuminate Glimmer ink over the Wild Wasabi image. The medium size snowflakes were stamped in Illuminate Glimmer ink. The small snowflakes were stamped in Baja Breeze ink. I think the Illuminate Glimmer ink works best on a darker card stock but you can still add a luminescent shimmer to any stamped images on a lighter card stock. Happy Monday! Hope you all had a great weekend. 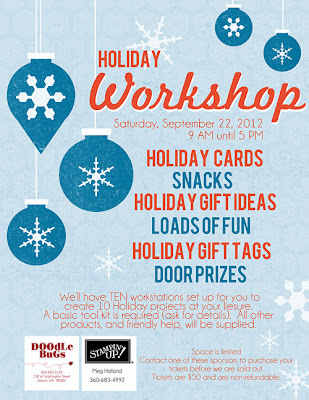 Our Holiday Workshop at Carrie Blake was another GREAT success!!! 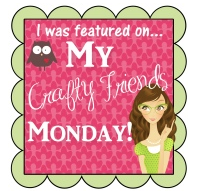 Thank you to those crafters who came to the workshop for making it a fun event. And for those who couldn't make it this time Doodlebugs and I are excited to tell you that we are planning another one in November. 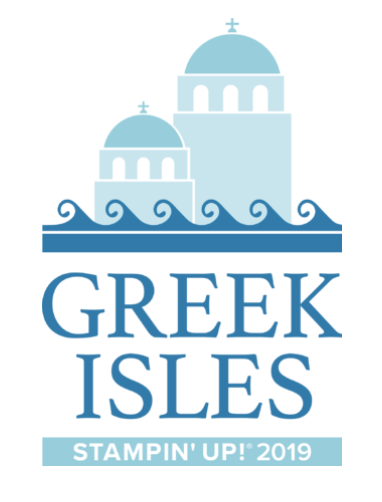 So stay tuned for more information in the next few weeks as we wrap up our thoughts and plans!!! Today's card looks probably familiar to you. It's a CASE from page 9 of the Holiday Catalog. I just changed my card a little bit by adding a piece of DSP instead of a card stock and added a big button. 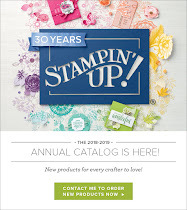 I LOVE Stampin' Up! 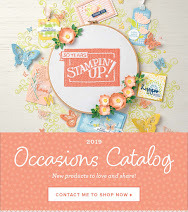 catalogs. There are so many samples that you can CASE (Copy And Share Everything). Aren't they SO CUTE? This card makes me HAPPY!!! Thank you so much for stopping by today. Hope you will have a great week! Happy Friday! 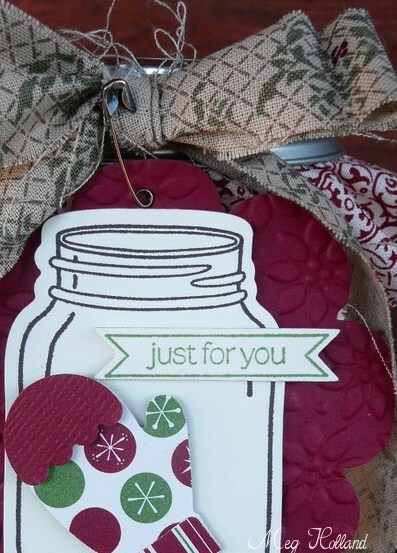 Here's a super easy gift tag to share with you today. The base of the tag is the Two Tags Bigz Die. I love the scallop edge and our 1/3/4" Scallop Circle Punch is perfect to layer with. I used scrap pieces of DSP to punch the mitten and a circle punch-out. A good way to use up your scraps!!! Thanks for stopping by today. Tomorrow is a big day for me. It's the Holiday Workshop at Carrie Blake!!!! It will be a lot of FUN!!!! Have a wonderful weekend! 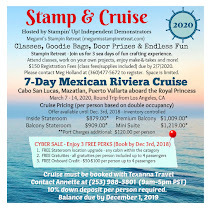 Hi Stampers! 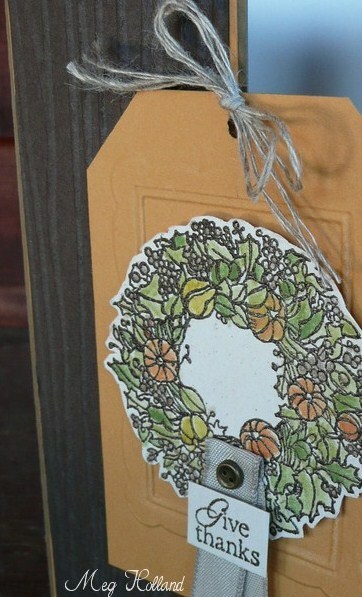 Here is one of the projects we are doing at my Card Club workshops this month. I love Cherry Cobbler and Gumball Green combination!!! To stamp the tree in two different shades of color, I stamped the "solid" tree in Gumball Green first. Then I applied the Platinum Shimmer Paint directly to the "outlined" tree with a Sponge Dauber. I also used the Stamp-a-ma-jig to stamp over the solid image perfectly. What a cool tool to get the perfect result!!! The background embossed image is the new Lacy Brocade Embossing Folder. When I was designing this card, I was looking for a shinny sparkly image so I sprayed the Vanilla Shimmer Smooch Spritz over the embossed paper. I LOVE the pearlized accent!!! Absolutely GORGEOUS!!! It's hard to see the sparkly flowers in this photo but they have some Dazzling Diamonds Glitter applied with the 2-Way Glue Pen. 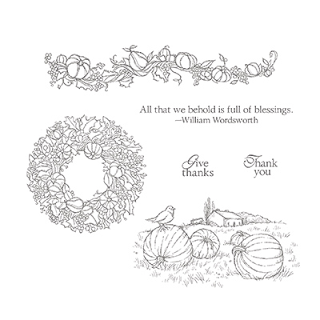 I LOVE the "thank you" embellishment by layering the stamped sentiment with two Framelits die-cut pieces from the Window Frames Collection and Bitty Banners Framelits Sets. I happened to have the Gumball Green banner piece in my scrap pile so that's how it ended up there. You don't want to waste anything, right? Here's is the inside of the card. I like the little flowers on the bottom too. Early Espresso - 1-1/2" x 5-1/4"
Orchard Harvest DSP - 2-1/2" x 5-1/4"
Don't forget the Back to Spool promotion!!! This Raspberry Ripple Ribbon is one of the five colors featured for this month's FREE ribbon special with EVERY $40 order (before shipping and tax). Click HERE to go to my online store and take advantage of this limited-time offer!!!! Thank you for stopping by today. 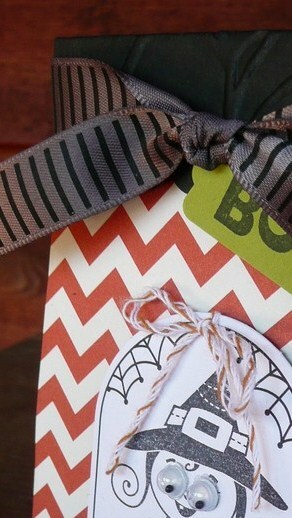 I can't wait to create this card with the Ink Pad Club girls tonight!!! If you are local and wish to come to tonight's workshop, please contact me. We will be making two cards. The cost is $5 for two cards or FREE with an order of $15 or more. Please bring your basic tools and adhesive with you. Have a great day!!! Hi Stampers! I have a very simple and pretty card for you today. I love this color combination (Baja Breeze and Basic Gray)! Isn't it gorgeous? I stamped the tree image in the new Illuminate Glimmer Watermark ink and then stamped the sentiment in StazOn Black over it. I know it's hard for you to see it in the photo but this new Glimmer Watermark ink really adds a luminescent shimmer to the tree and it's SO PRETTY!!! So I was trying to see the difference between the new Illuminate Glimmer Watermark ink and the Platinum Shimmer Paint. The Platinum Shimmer Paint has much deeper shimmery effect than the Glimmer Watermark ink but the sentiment in the middle is harder to see. It's still pretty though in my opinion. Thank you for stopping by today. Take care!!! Hi there! I had so much fun creating this card. Isn't the spider in the jar SO STINKING CUTE??? I had no intentions of making a Halloween card this morning but couldn't resist when this idea popped into my head. Oh, well! Here you have it!!! I hope you can see the embossed background with the Spider Web Embossing Folder. I sponged it with the new Illuminate Glimmer Watermark ink to add a luminescent shimmer to the embossed image. Here is the inside of my card. The stamp is from the Seasonal Sayings Stamp Set in the Holiday Catalog. I stamped it with Basic Black and Tangerine Tango Stampin' Markers. Happy Friday!!! I have a gorgeous card to share with you today. I don't know why but this card makes me happy....probably the colors that I used. They are Cajun Craze, Soft Suede and Very Vanilla. 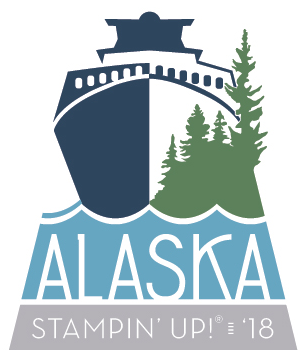 The stamped image is heat-embossed with the Gold Emboss Powder. I used the Blender Pen and Cajun Craze ink to color in the "Heartfelt" word to add a little more color to the image. The Very Vanilla Seam Binding and Antique Brad add a little more fancy look. Hi there! I had so much fun making this adorable gift bag with the new 1-1/4" Scallop Circle Punch the other day. The bag is actually a lunch bag I found in my kitchen. I got an idea from the Holiday Catalog and had to give it a try. It was super easy so I had to make another one! This time I added a piece of DSP on top to add more color to the bag. I LOVE the new Sweater Trim!!! It makes a great handle for the bag and really adds an extra touch to any projects. Thanks for stopping by today. I hope you will give it a try to make your own gift bags this Holiday season. I'm sure you have some lunch bags at home. It a great way to clean your stash of DSP scraps!!! Have a great day!! !